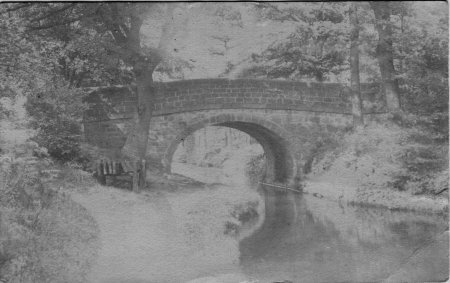 This faded Real Photo shows Chase Bridge (number 14) on the Cromford Canal between Whatstandwell and Ambergate. In front of the large tree on the left is a holding frame containing 4 stop planks. Crich chase is the large area of land above the canal to the North, formerly a royal hunting ground. The canal was opened in 1794, and served coal mines and lead smelting plants at Lea, limestone and gritstone quarries at Crich and Lea, and the Ironworks at Alderwasley, but was not used by Arkwright's cotton mills at Cromford. Engineer Willam Jessop estimated the cost at £42,697 in 1788. In 1830 the canal connected with the Cromford & High Peak Railway, and traffic rose to 300,000 tons per year. From the 1840's, competition from the new railways reduced income, and the whole canal was officially abandoned in 1944.